But you know my name. Always remember you hold a place in my heart. Feel free to share - thanks for reading! A poem about life written by Anthony that touches on humanity's inclination to believe in law & structure to restore order and faith in happenings day-to-day. Last Thursday I flew into Orange County for a meeting, so I've been a little swamped from all the activity. Not to mention all these travel arrangements for New York Fashion Week! Clearly I'm dying a little on the inside just thinking about all the glory that is fashion week. Anyway, since I'm traveling a bit, I have to be sure that I'm comfortable in what I'm wearing. Airport visits are not only long, but typically extremely gruesome considering all the walking, lugging, and lifting you have to do. With that, I also have to keep in mind the style factor. As much as I want to be comfortable, I also have to feel confident, which is exactly what this look does. Not only did I wear it through a SEVEN HOUR layover, but I was comfortable doing it. The coat kept me warm, sweater kept me bundled, and jeans were easy to move around in (no matter how tight they may seem). My fringed Gucci loafers came with their own fringe benefit, too - they can be slipped on and off with ease, making them perfect for airport security. Definitely a functional look to keep me moving through the long lines of people. Would love to hear your thoughts! What's your favorite airport style? Are you more for style, comfort, or both? Feel free to share in the comments below! This weekend was kept pretty simply. My best friend Lexi and I spent some great quality time together while my boyfriend was away in Manhattan. Since I typically don't get to see my friends as often as I'd like, it was exactly what I needed. Friday afternoon I spent some time getting ready for the Ministry of Supply grand opening in San Francisco. Since I was driving in from San Jose to mix & mingle, I had to look my best (or at least try to). 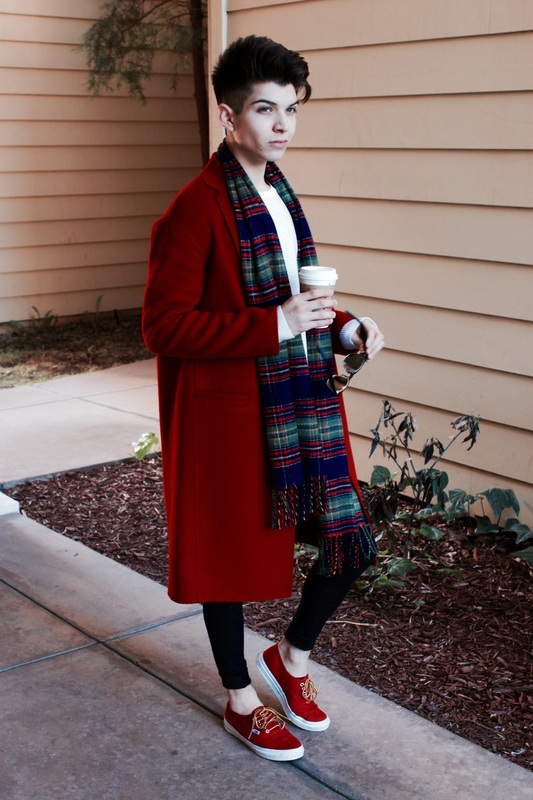 I feel really confident in my modern red VINCE coat, so I sported that with some never-before-worn pieces underneath. Saturday we got off to a late start after I made us an amazing brunch. Once ready, we set off to the Palo Alto / Stanford University area to get some shopping out of our system. The weather was sunny, beautiful, and t-shirt appropriate. My cement grey Joie trousers and all-black hat, shirt, & shoes combo really made for a simple, but cool look. All in all, I had a fantastic weekend that was filled with great friends, great food, and great memories. And now that Jordan's back from New York, it'll be nice to hang out with him a bit (or until it's my turn for a vacation). How did you spend your weekend? Feel free to share in the comments below! Today's a post is simple, but it works. 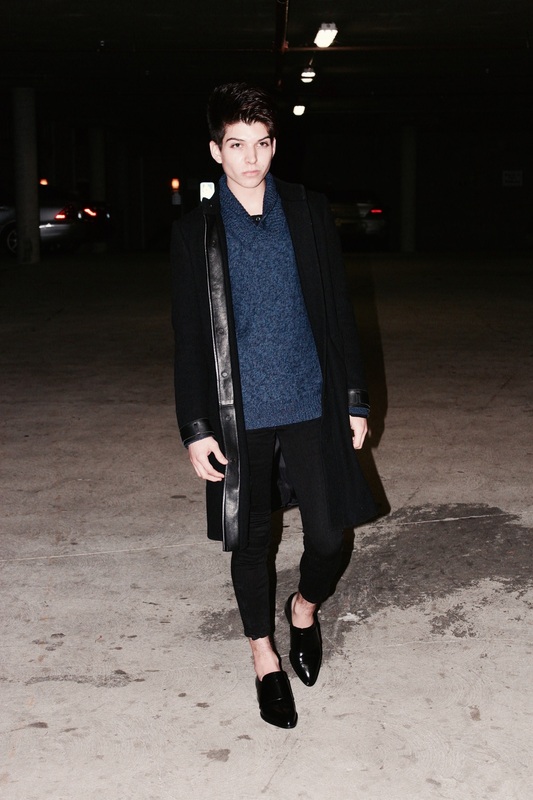 It features the look I sported today, including a teal Your Neighbors Jacket and pumpkin orange Calvin Klein oxfords. Since they're both very muted shades of their respective colors, it makes the combination that much better. Dark fall & winter colors have always been my favorite. Assuming I can get away with adding a few more pieces to my wardrobe, they'll more than likely be rich in color as well. What has me especially preoccupied is finding great brands and pieces to wear during New York Fashion Week. Since I will be changing often, I need to find some really great, classic, eye-catching pieces that will get people talking. If you know of any brands or happen to represent one, I'd love to hear from you. Feel free to reach out via the contact page and I will get back to you within a day. Thanks! 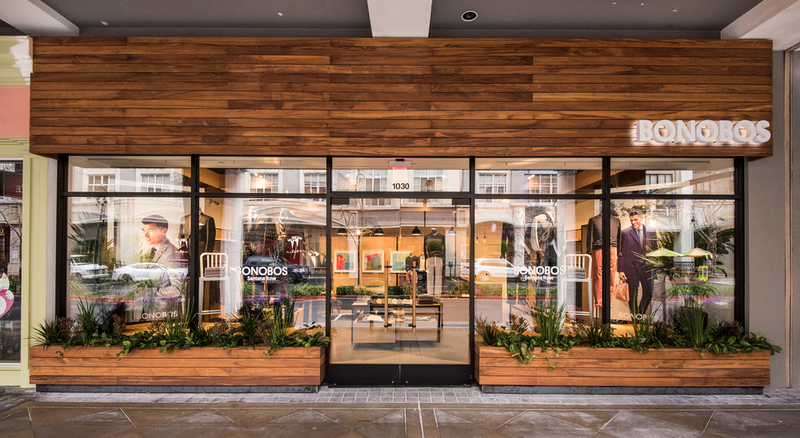 A sneak peek at the new Bonobos Guideshop opening Thursday, January 22nd on Santana Row. Yesterday I was lucky enough to get an invite over to the new Bonobos Guideshop on Santana Row. Here in San Jose, Santana Row is most known for its quality shopping and its selection of contemporary and luxury stores. With the new Bonobos so close by, I finally had the opportunity to see what the brand is all about considering it's now among some of the best shopping in town. When I got to the new location, I was immediately impressed by the layout of the shop. See, the Guideshop is a little different than the typical stores that most are used to. The way it is all set up is similar to that of a showroom - you walk in, are assigned a stylist, and with your stylist you try out a selection of styles that work best for you. It's great because the Guideshop experience isn't about finding a highly trending piece, it is about helping you find classic, transitional pieces that will last. I had a really emotional experience while I was in the store. The clothing came in my size, length, and fit me almost perfectly off the rack. Once my measurements were found, they were sent to me so I could never forget what sizes made me look and feel my best. Since I have such a slender build, I almost said no to going for the sake of sparing my own embarrassment, but they really made it work. I'm extremely grateful for the experience I had, especially with Fashion Week right around the corner. Since I'm in dire need of something dapper, I'll definitely be turning to Bonobos' Guideshop soon. If you have the time (it only takes about an hour), then I would suggest you make an appointment and head over there, too. Your confidence will thank you for it later. Yesterday was a great day for many reasons, but the biggest reason was my boyfriend coming home from a long weekend away. He spent his time in Texas Friday - Wednesday, so I was home with our two dogs in the meantime. Before I went to pick him up from the airport I stopped by Starbucks to quickly grab him some coffee and pumpkin bread. It just seemed like a great choice given the weather. 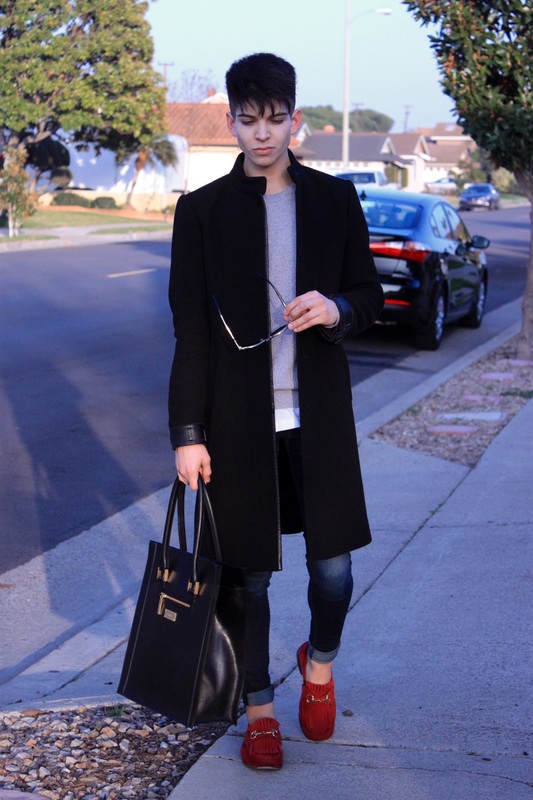 I bundled up in a big & cozy VINCE coat that I picked up on sale. The red (they call it Claret) is so rich that I couldn't help but drool over all it's goodness. 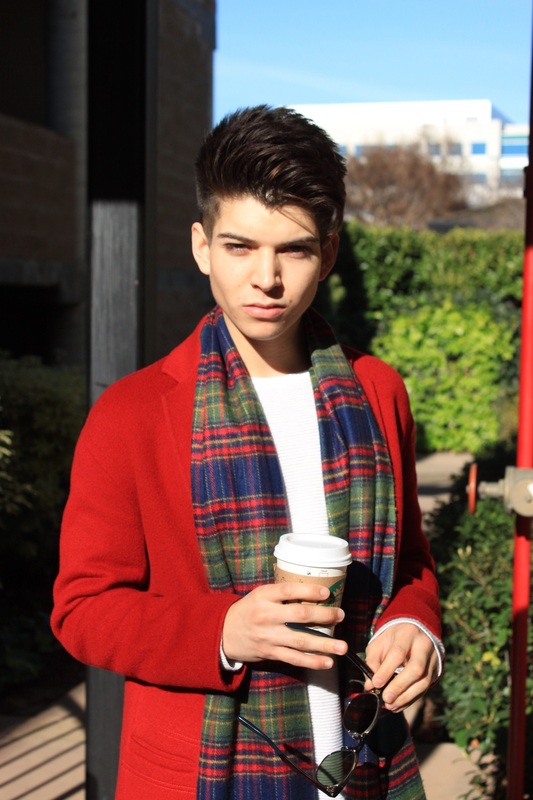 I wore matching red shoes and a plaid scarf with red in it to help bring the look together. 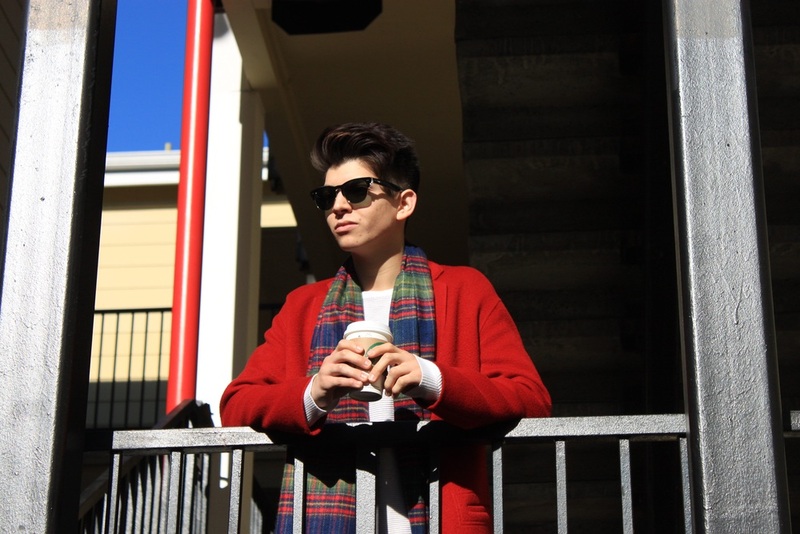 Instead of a t-shirt, I wore a winter white sweater to add some texture and extra layers. And looking back at the photos, I'd have to say that it all worked out better than I expected. I'd love to know some of your winter go-to's. 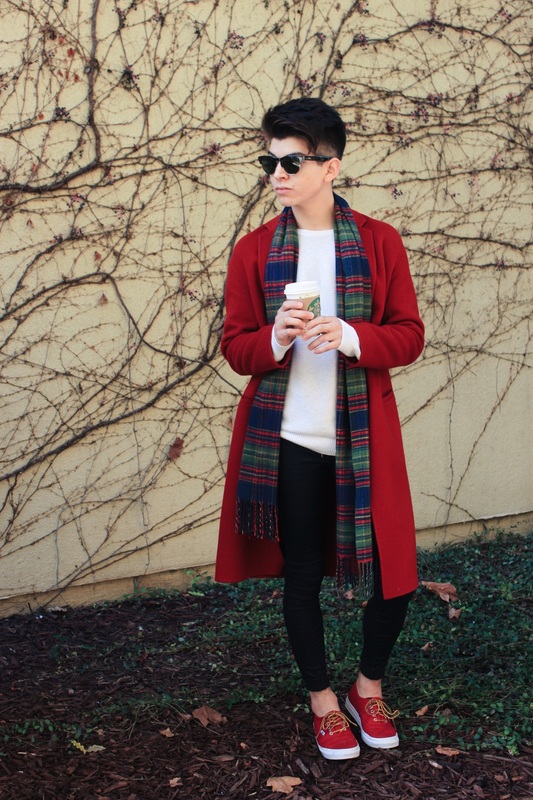 Do you have a favorite coat you love to wear? What color is it? Feel free to share in the comments below. I've been having a lot of fun playing around with different looks and styles as of late. There's just something about finding a new way to wear a piece that really gets me going. So instead of going with the traditional preppy look that my blue rollneck American Rag sweater gives off, I went with a darker (almost vampire-esque) look. The blue sweater is so rich that it stands out against black really well, so I was more than happy to sport this style around San Jose / San Francisco. Since the mandarin collar Vince coat allows for some third-party collar action, my American Rag sweater did its job and did it well. This definitely won't be the last time you'll catch me wearing this outfit (or one similar). 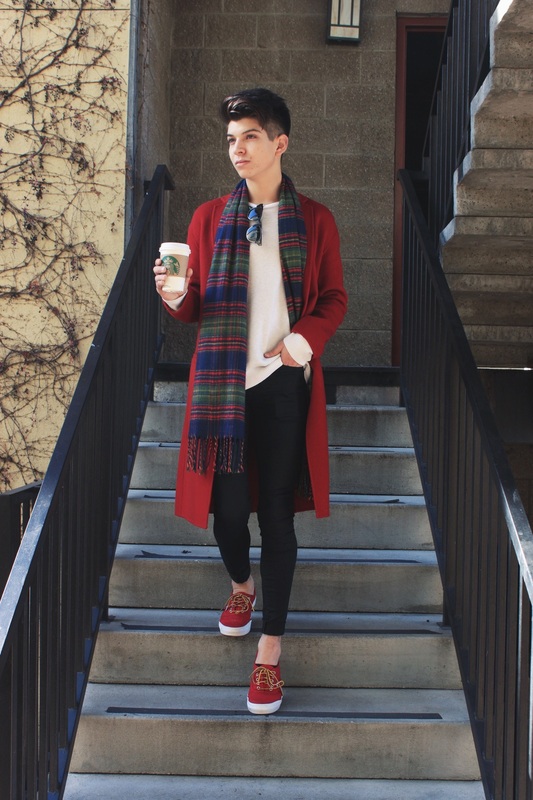 I'm currently on a hunt for more amazing sweaters with similar styles to the one pictured above. I have no idea where to look since this rich blue American Rag sweater was a gift from my parents for Christmas. If you know where I can find one (and at a reasonable price) then please share in the comments below. Sharing another favorite look from this weekend's adventures around the South Bay Area and San Jose neighborhoods. My boyfriend and I really focused on just getting ourselves out of the apartment and somewhere new. Since he and I are both certified workaholics, it makes sense to separate ourselves from what can sometimes take away from our quality time together. And though we sometimes insist that working side-by-side is quality time, that's definitely not always the case (ever). This outfit is definitely one of my favorites and will be for a long while I'm sure. I sported my new favorite black leather tote bag equipped with enough room for the essentials: laptop, planner, an extra shirt, and some miscellaneous stuff like Chapstick and a pen. The bag is great because it really complemented the sleek sheen that my new Vince Yaeger loafers give off. Super classic and dressy feel without being too much. I threw on a cozy coat and sweater because the sun being out doesn't always mean it will be warm, and that was definitely true here. Still a fantastic day, though! Cold and all. And everything I've explored this past week has been so pretty and peaceful, I can't wait to see what else is hidden away in the area. If you have any suggestions of where to go in the San Jose area, please let them in the comments below! Checked out some other great parts of the South Bay / San Jose area that were such a breath of fresh air. Literally. Everything was so open and green that nothing could take away the calming moments you experience being outside. Since Sunday was such an adventure, I had no idea what to expect. All my boyfriend suggested was to grab some extra clothes and the leashes for our dogs. Took me a while to get it together, but we made it out the door in good time. This is probably going to be one of my favorite looks this winter. What I love most about it is the texture it all has and how well it all works together. 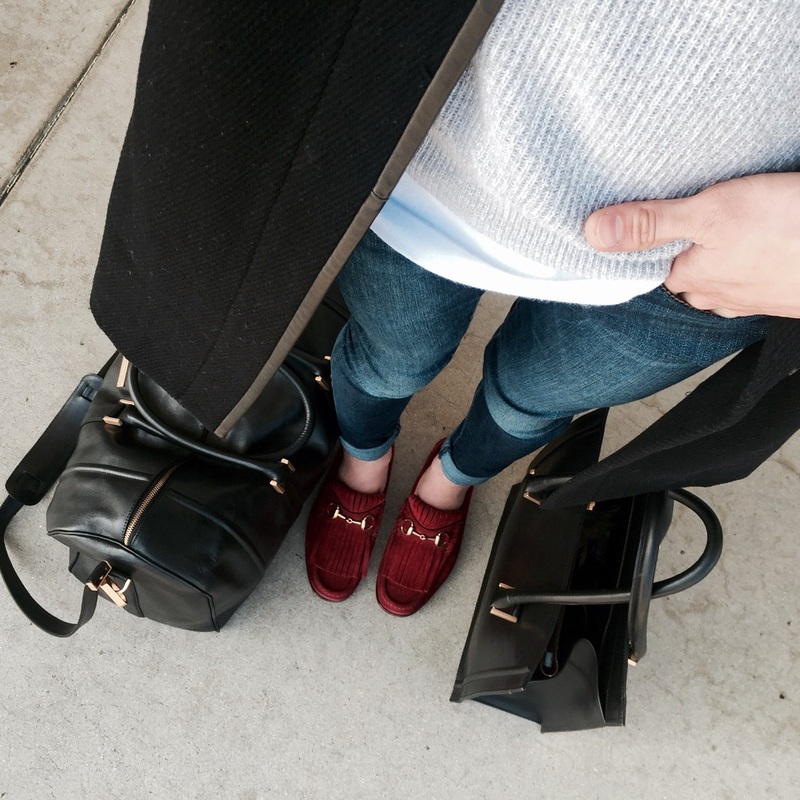 Both the black leather duffel bag and black Vince loafers were so sleek, it'll be easy to find the reasons to use them. All in all, I'm going to have fun finding what other casual-classic looks I can muster up. Check back soon to see what I come up with!